This month’s edition of JMM Insights is from Executive Director Marvin Pinkert. Read more posts from Marvin by clicking HERE. Missed any previous editions of JMM Insights? You can catch up here! Is it September 1845, the opening day of the original Baltimore Hebrew Congregation (now the Lloyd Street Synagogue)? Is it in February 1959, when Wilbur Hunter’s designation of that synagogue as one of the 13 most important structures in Baltimore inspired the Jewish community to save it? Is it November of 1964, when we first welcomed visitors and established a collection? Or is it in 1984 when we became the Jewish Museum of Maryland, adding new exhibit space, programs and education to our mission? The fact is, it’s none of those and all of them. We don’t have a birthday. We weren’t born—we evolved. We have adapted. We’ve grown. We’ve evolved to suit the needs of the three worlds in which we simultaneously live: Historic Jonestown, the Jewish Community, and Public Museums. Over the last several years, the Board and staff of JMM, in consultation with our colleagues at The Associated, have been giving considerable thought to the next stage of our evolution, and today I’m ready to share some of that with you. As far back as 2008, we’ve been thinking about what comes next for the Museum. That’s when, through the generosity of the Herbert Bearman Foundation, we acquired the property occupied by Lenny’s restaurant. >insufficient space for temporary exhibits (to allow us to trade projects with other Jewish museums with larger galleries as well as being able to split the gallery between two projects). To connect the Maryland Jewish community to its roots, and to connect everyone else in Baltimore (resident and visitor alike) to the Jewish experience. Our evolution started from historic site to museum it will continue from museum to community connector. We have always provided curious visitors with experiences that they transformed into memories. In the 21st century, we’re looking for more than memories. We want the memories of the experiences we provide to be transformed into actions that benefit the whole community. We want to create Upstanders. As our evolution plans develop, we’re being guided by best practices in all three worlds. From the Impact Hub on North Avenue to successful, hybrid classroom-exhibits at the National Archives, our role models are the best in their fields. We’re also looking for smart and value-driven partnership opportunities. Notably, we’ve begun a dialogue with our colleagues at the Jewish Volunteer Connection about their operations residing in Jonestown, sharing a campus with us, and envisioning an evolved Jewish presence in this neighborhood. That presence would meet the needs of Jonestown’s service organizations (Helping Up Mission, Living Classrooms, Ronald McDonald House, JMM and others) for additional volunteers, meet the desire in the Jewish community to engage in acts of tikkun olam, and closely align with the movement in the museum world to remain relevant as advocates for a cause, not just stewards of objects. 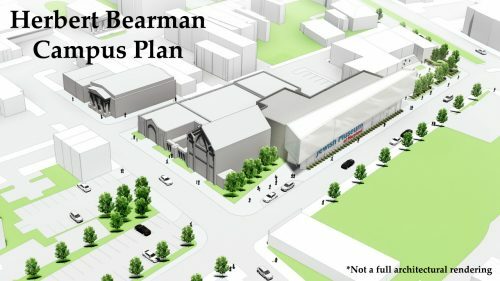 We have begun the work of developing a concept for a new structure – large enough to meet both our own expansion needs and the needs of potential partners—and designed to help serve the community in which we are located. 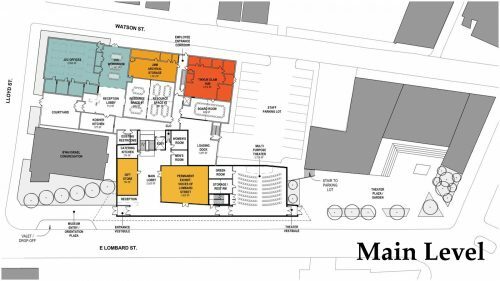 The concept begins with a new museum building facing Lombard Street, replacing the existing Lenny’s building, dramatically increasing JMM’s visibility (an estimated 70,000 cars per week come down Lombard Street in contrast to 7,000 cars per week on Lloyd Street). We want to work with the city to increase available parking and will also provide a drop-off area for school busses and peak day valet parking. On the main level of the new building we feature the new 160-seat theater, which can also be configured as a banquet space. We are also re-mounting and updating “Voices of Lombard Street” on this entry level. 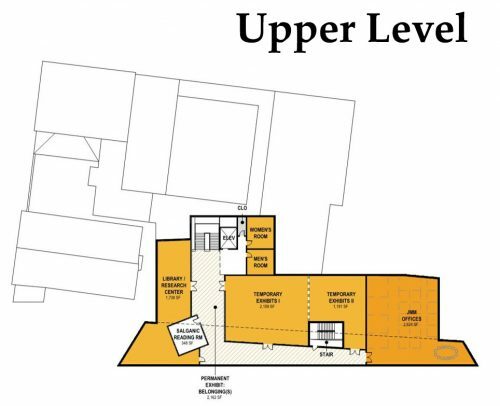 As you can see, the existing building is now home to the Jewish Volunteer Connection, our co-working hub and plenty of shared space (including a kosher kitchen) available to all the campus organizations. 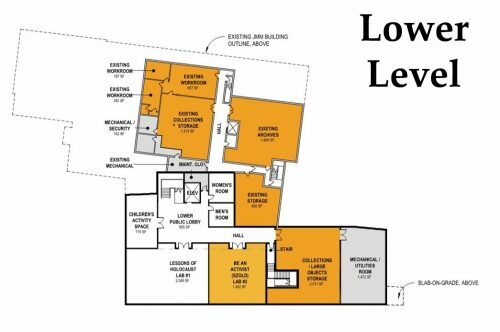 The lower level adds new storage space to our existing collections and archives rooms. It also features a new area designed to meet the needs of our growing numbers of school group visitors. Spaces include the school group assembly area, a workshop zone and two new lab experiences, providing task-oriented, immersive learning environments for field trips. The upper level is actually linked through a new permanent exhibit (“Belonging(s)”) that combines real artifacts from our collection with Augmented Reality, allowing every visitor to virtually manipulate the objects as well as “curate” and share their own story of connections to our past. Also on this level is our new genealogy center with oral history kiosks as well as our expanded space for temporary and traveling exhibitions. Not only is this plan exciting it is also timely. The Associated will soon enter its centennial year of service to the Jewish community of Baltimore. Laying the foundation for the next century, The Associated has selected a handful of significant projects that merit community support and align with the objective of putting Jewish values into action. JMM’s “evolution” and the expansion of our campus have been identified as among those priority projects and they are our partners in securing the underwriting required to complete this work, estimated at $18 million (yet another good reason to support The Associated). A lot of work lies ahead, not just in raising the money, but in refining the design, planning for operations and coordinating our efforts with JVC and the Jonestown community. But as 2018 comes to a close, I wanted to share this optimistic news with the whole JMM family – what a year we have ahead!